The demand for action against climate destruction is becoming louder and louder and more and more people are getting involved! On the 10th of March we marched, despite the cold and the rain, with over 40.000 people from the Dam to Museumplein in a legendary Climate March. On the 23rdof March we joined the anti-racism march to put climate racism on the agenda. But, as attention for climate change grows, so does the resistance against climate policies. The huge growth of the climate-denying, white nationalist Forum voor Democratieis something we cannot and will not ignore. We therefore actively work on building strong collaborations with other movements and groups fighting injustice, inequality, exclusion and oppression. Because we’re all part of the same struggle and together we are stronger. And together we can achieve more. In this newsletter we inform you about plans and actions that you can join! 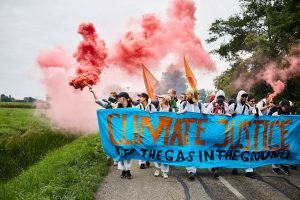 From 19 til 24 June, the German coalition Ende Gelände organises civil disobedient actions against the lignite indsutrie in the Rheinland area. And it is becoming a tradition by now: Code Rood, Groenfront! and ASEED organise the Dutch participation in Ende Gelände. We will organise busses and action trainings ahead of the action. More information can be found at this website. And we recommend you keep an eye on facebook as well! Please note: Our Action Conference weekend, that we planned on the 11th and 12th of May is being postponed! We will share a new date soon, which we expect to be in June or July so we can work together on our action plans. Power Beyond Borders is a mass summer mobilisation organised by Reclaim the Power in the UK from 26 July to 1 August 2019involving a mass camp and mass actions actions against i) new gas infrastructure ii) in solidarity with groups fighting state violence against migrants. This action has been chosen as one of Ende Gelände’s two international actions that they are supporting and promoting in 2019. Reclaim the Power are making their first international call-out to European comrades to join them for the first time in taking action against both the border industry and against new gas fired power stations at one action camp in July this summer. The aim is shut down a piece damaging energy infrastructure & shut down part of the border industry. Please email powerbeyondborders2019@riseup.net to register your interest in joining the Dutch group heading over there to take action together this July. Last month we worked together with the eco-village of Diamondiaal in Almere to organise the bloc against climate racism and the anti-racism march. Now the people in the village are threathened with eviction. Without a suitable living solution for the inhabitants. This is the sad outcome of poor policy and greed. We find this unjustified and unacceptable and support for the people at Diamondiaal is needed. Here you can find more information about the case. On Friday the 12thof April there is a courtcase, where you can go to show support and solidarity. Groenfront! Almere organises several events and support actions in which you can join. More information on this can be found here. Also, you can sign a petition to stop the eviction. In more than 35 countries, Extinction Rebellion (XR) kicks of weeks of rebellion as of the 15thof April. The rebellion weeks will include protests and civil disobedience to resist against the ecological crisis we are facing. Hundreds of the people in the Netherlands will join in actions and break the law to disrupt public life. XR NL demands that the Dutch government speaks the truth about the ecological crisis and takes real action. On the website of Extinction Rebellion NL you can read all political demands. On Monday the 15th, the protests start at 15.00 in The Hague, with the ‘Declaration of Rebellion’. After this, actions follow throughout the country. The full programme is available on the website and it is recommended to keep an eye on Facebook for the latest updates. Apart from helping with action plans, joining actions and supporting Diamondiaal, you can also support climate justice from behind your computer. Tell the people around you about Code Rood and how they can support! Donations are also always welcome: NL55 TRIO 0388 6023 80 t.n.v. Steungroep NVDA. 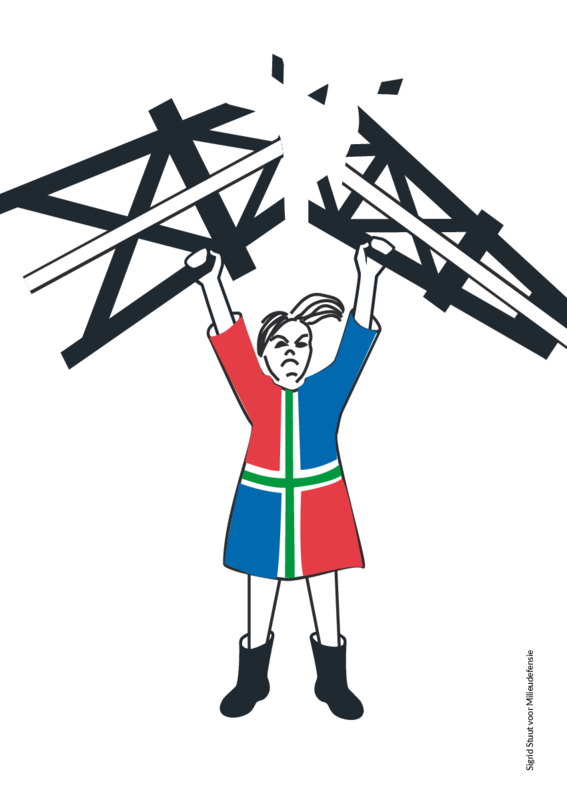 Sunday the 10th of March a historical climate demonstration will take place in Amsterdam, organised by a wide coalition of civil society organisations. It is expected to become one of the largest climate mobilisations in the history of the Netherlands. ASEED Europe, Code Rood, Climate Liberation Bloc / CLuB, Fossil Free Culture NL & GroenFront! are supporting this Climate March and are calling for the organisation of a large and powerful Bloc for Radical Climate Justice. Together we will raise our voices for system change and mass action from below: against the fossil fuel industry and a corrupt political and economic system that exploits and divides people, produces obscene inequality and destroys most forms of life on our planet. While CO2 levels and global temperatures are rising faster than ever in human history, Code Rood is inviting you to a national gathering on the 2nd of February to discuss what should be the next steps for mass civil disobedient action for climate justice and against the fossil fuel industry in the Netherlands. In this meeting we will bring together and discuss the viewpoints collected during the decentralised meet-ups that were organised in December (Amsterdam – Rotterdam – Utrecht – Leiden – Nijmegen). This will be a moment to reflect on the politics and strategy of Code Rood and its position within the climate movement at large, and to find common ground and clarity on where and how to most effectively invest our energies in the next year. The meeting will be a platform for collective analysis and discussion, providing crucial input for the action conference that will be organised in March, where decisions will be made regarding the plans for Code Rood in 2019. Did you participate in one of the local meet-ups and want to get more involved? Are you interested in better understanding Code Rood’s working structures? Did you take part in climate action before, and want to contribute to stepping up the fight against the fossil fuel industry? Then please come through! Because we know that ‘ordinary people’ like us have to continue building this movement. After all, politicians and multinational polluters will not protect the climate for us, regardless of their greenwash propaganda. 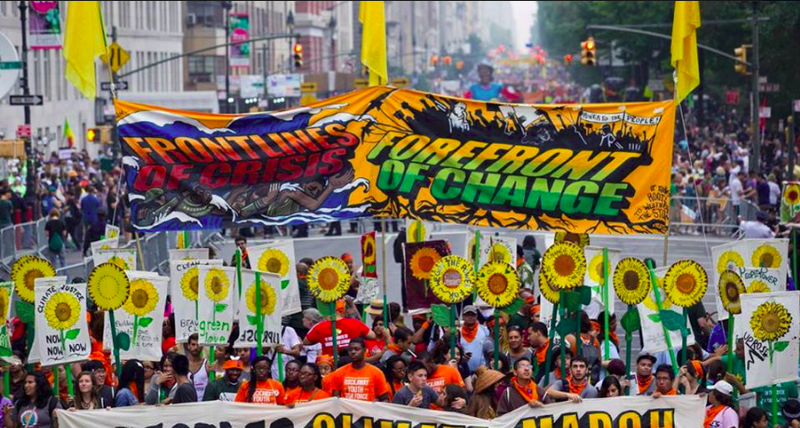 In the face of climate chaos, our hope is on grassroots organisation! After 2 years of Code Rood, the moment for reflection and coming up with next steps for the movement has come. We are faced with questions like: What works well with the organizational form of Code Rood and what should be done differently? How do we build the movement, and what role does Code Rood play within social and climate movements? But also: Are we going for a major mass action in 2019, or do we want to focus on multiple decentralized actions, and are we going to build several local Code Reds? and Utrecht on December 16th. You’re encouraged to set up a local meet-up in your city to think about these issues, because Code Rood comes from people everywhere! Mail to coderood-mobilisatie@lists.riseup.net for help with setting up a local meet-up, and check out the instructions on the website. These meet-ups play an important part in determining the direction we are collectively headed as Code Rood, so it would be good if as many people as possible think along! After the local meet-ups we will gather the outcomes for further discussion in February, so that we can do collective decision-making in March! Don’t forget to also fill out the Code Rood 2018 evaluation form if you haven’tdone so already. A few months ago we took to mass action to block the entrance of the tanker park in Farmsum, where the toxic waste product resulting from the gas extraction in Groningen is brought. Over a year ago we blocked the coal harbour in Amsterdam. We have celebrated our successes and collected lessons to be learned. And we’ve grown beyond expectation. Now we face the question, now what? Read more in this newsletter about the opportunities for reflection and next steps for Code Rood. Also in this newsletter, information about the actions of Extinction Rebellion in the United Kingdom and the action around the earthquake emergency exercise in Groningen. 1. LOCAL MEET-UPS: 2 YEARS CODE ROOD, AND NOW WHAT? 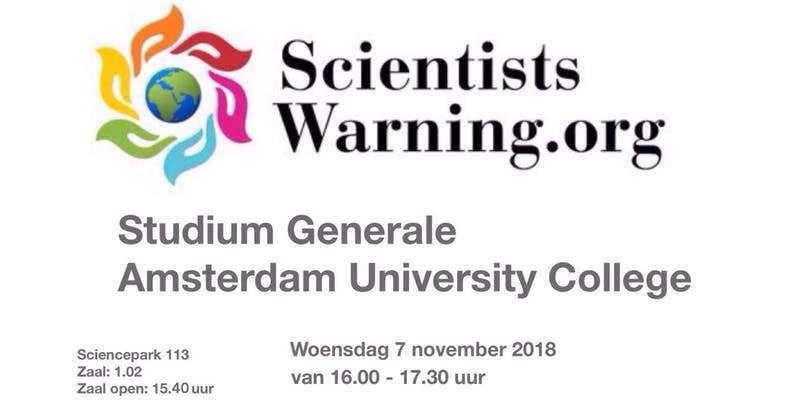 Several local meetings are already being organized in Amsterdam, Rotterdam (both on 13 December) and Utrecht (16 December). You’re encouraged to set up a local meet-up in your city to think about these issues, because Code Rood comes from people everywhere! Mail to coderood-mobilisatie@lists.riseup.net for help with setting up a local meet-up, and check out the instructions on the website. Don’t forget to also fill out the Code Rood 2018 evaluation form. It’s Extinction Rebellion in the United Kingdom! Thousands of people are taking to action for their government to treat the urgency of climate chaos as the emergency that it really is. See here their video “Heading for extinction and what to do about it”. Like XR says, the inaction in the face of climate breakdown is criminal, so it is up to us to rebel! Last Saturday thousands of people occupied five important bridges in London. Time is running out and proves that civil disobedience is necessary. Thousands are willing to make the city come to a standstill, willing to be arrested for the resistance against climate injustice, until the truth is told about the threat that climate chaos causes for life everywhere. Watch them closely because this Saturday is Rebellion Day 2. See also Extinction Rebellion NL if you’re in the Netherlands and take part in the picture this Saturday in solidarity with the action participants in the UK. STOP THE GAS EXTRACTION – ACCELARATE THE REINFORCEMENTS – GIVE MORE POWER TO THE PEOPLE. The next steps of Code Red also have to be financed. We are an independent movement that can exist entirely because of volunteers. Do you want to contribute to Code Rood? Transfer a donation to NL55 TRIO 0338 6023 80 (name: Steungroep NVDA). Do not forget to set up a local meet-up or join an already organized local meeting. The resistance continues! This presentation will explore the dysfunctional ‘operating system’ of global society. The hope of future generations depends upon remedial action. Thus far, societal response to the warnings issued by scientists and spiritual leaders has been inadequate for the task at hand. The human-induced ecological stressors will be discussed in light of our collective blindness to the existential threats and the urgency of action before collapse becomes inevitable. Who: Stuart Scott from Scientist Warning.org and ClimateMatters.tv is an internationally acclaimed public speaker. He has founded numerous strategic initiatives, all aimed at moving society towards recognition and real, meaningful action to alter our current disastrous trajectory.